Is White House Sports Culture Detrimental To Women's Advancement? Citing a team sport heavy culture, the Obama administration is under fire for the lack of women at high profile games. Yesterday's New York Times cut straight to the point: "Does the White House feel like a frat house?" The president, after all, is an unabashed First Guy's Guy. Since being elected, he has demonstrated an encyclopedic knowledge of college hoops on ESPN, indulged a craving for weekend golf, expressed a preference for adopting a "big rambunctious dog" over a "girlie dog" and hoisted beer in a peacemaking effort. He presides over a White House rife with fist-bumping young men who call each other "dude" and testosterone-brimming personalities like Rahm Emanuel, the often-profane chief of staff; Lawrence Summers, the brash economic adviser; and Robert Gibbs, the press secretary, who habitually speaks in sports metaphors. The technical foul over the all-male game has become a nagging concern for a White House that has battled an impression dating to the presidential campaign that Mr. Obama's closest advisers form a boys' club and that he is too frequently in the company of only men - not just when playing sports, but also when making big decisions. This weekend, foreign policy aide Chief Domestic Policy Adviser* Melody Barnes was invited to the party, becoming the first woman to join the golf outings since Obama became President. Other women in the administration say that any discussion of White House culture should account for how politics has long been dominated by men but is now more inclusive. Ms. Dunn, who had to take a typing test three decades ago to work for a campaign, rejects the notion of a boys' club. She calls the Obama administration "refreshingly un-self-conscious" about matters of equality, maybe to a point where they neglected the "optics" of the all-male basketball game. Ms. Dunn said that she recently hosted a baby shower for an administration official and that no men from the office were invited. She is comfortable with that - just as she is fine with never playing basketball with the president. "That is just part of the culture here that I am excluded from," she said. "And I don't care." So if they don't care, should we? I think so. I can definitely understand how many women may not be interested in playing sports at work; however, having read dozens of books, hundreds of articles, and attended conferences on how women and minorities advance in the workplace, this question shifts a little. It isn't quite a question of opportunity, as much as it is a question of access. 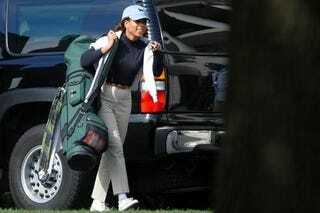 And doing things like going golfing with the boss are part of the traditional path to access. This is one of the opportunities for your boss or potential client to get to know you outside of a business capacity, which may make a crucial difference in decisions about projects and promotions. The Obama Administration has shown its commitment to women on many different levels, so I'm willing to assume the best on this count. But this recent attention is actually a valuable reminder to watch the traditional paths to power. After all, adequate representation is only half of the battle - do women hold enough clout and access to make major decisions and to push forward their own ideas? *Correction - Melody Barnes' title was misidentifed in one of the source articles from this morning, and I copied that title over here. I regret the error.